For instance, a scaling of 108 means that a picture document of 100 x 50 mm edge length is stretched by 108% of its original size, thus it will later measure 108 x 54 mm . On the other hand, under some circumstances, it can make sense to print an image document which is just 2% too large to fit the next smaller paper format, on 98% of its original size. 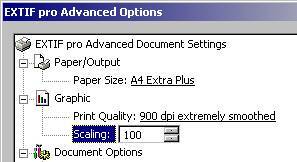 However, in general, we advise you not to use other scaling values than the default value of 100.